39 year old Chief Petty Officer Kevin Williams has been missing since Tuesday, May 28, 2013 around 2:30 pm in Jacksonville, FL after he and his wife, Vanessa, got into a fight in a mall parking lot. His wife claims that after they argued, she walked off in the other direction, but told her husband to stay put. However, when she returned to the spot where she left him, Williams was gone, but he left his cell phone behind. Authorities are saying that Williams used his ATM card at a convenience store near the Avenues Mall, the evening of his disappearance. Kevin Williams was last seen wearing his blue camouflage uniform. The U.S. Navy is considering William AWOL at this time. Authorities are characterizing Williams’ disappearance was characterized as unusual, police do not suspect foul play. Authorities are trying to piece together where a respected Jacksonville, Fla. navy recruiter may have gone after he was reported missing 12 days ago. 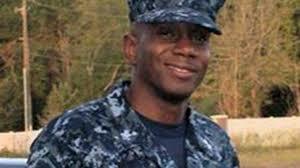 Chief Petty Officer Kevin Williams, 39, was first reported missing by his wife, Vanessa, after the couple got into a fight in a mall parking lot on May 28. In the heat of the argument, Vanessa Williams told ABC News that she walked off in the other direction, but told her husband to stay put. “I was so mad with him, so I said ‘Wait here. I’m not…I don’t want to walk with you and argue anymore,” she said. But when she returned to the spot where she left him, Williams was gone, but he left his cell phone behind. If you have any information about his whereabouts, please call 904-630-0500.